NO VENDOR CHAIN! HOME ESTATE AGENTS are delighted to bring to the market this fully renovated mid town house in a very popular part of Partington. Our vendors of the property have fully renovated this property with tasteful decor new kitchen and bathroom and brand new fitted carpets throughout. This home is in drop your bags condition. Loacted on a quiet residential walk and only a short walk way from the new shopping precinct and public transport links. The accommodation comprises of porch, through lounge dining room and open plan modern fitted kitchen. To the upstairs are three good sized bedrooms and a three piece modern bathroom suite. The property is warmed by gas central heating and is fully double glazed. To the outside front is a fenced mainly lawned garden. To the rear is a generous sized garden which is mostly lawned. 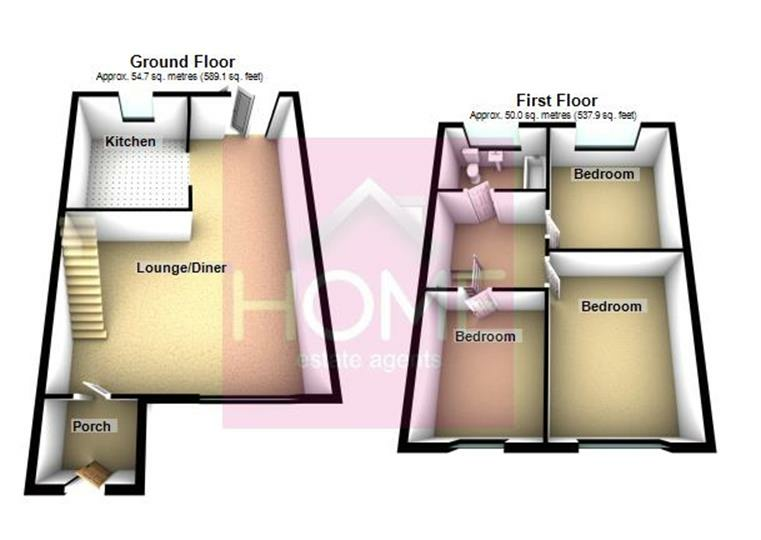 To view this property call HOME on 0161 7471177. A white bathroom suite comprising of bath. Pedestal wash hand basin and sink.